Fangirl Happy Hour – Page 2 of 14 – Ana and Renay on the intersections of fandom, literature, and culture. To celebrate, we’re hosting a very short, one day giveaway of a book of your choice that’s under $20. The giveaway is international, as long as you can receive books from Book Depository. Join us in celebrating the bees (space bees and otherwise). We’re continuing our personal celebration of warmer temperatures by spreading OUR joy to everyone else in the form of BOOKS. 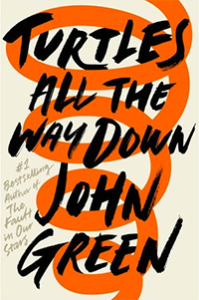 This week we’re giving away a copy of Turtles All the Way Down by John Green. It’s one of the books provided with a purchase of a ticket to the tour John and Hank Green did in 2017 and so it’s a signed copy! Renay and her partner went together, but they only need one copy of the book. Instead of it continuing to gather dust on the shelf: a giveaway! Enter below. Good luck and DFTBA! Giveaway is for one signed hardcover copy of Turtles All the Way Down by John Green and is INTERNATIONAL. Winner will be notified by email and will have a week to respond. Please whitelist fangirlhappyhour@gmail.com so we can reach you! The Literary Fairies have been kind to us recently, so we have a stock of goodies to give away over the next few months to celebrate the arrival of SUMMER in the US/UK. Summer is important to the producer’s health, whose depression and anxiety are improved by increased sunlight/warmer temps. Therefore: celebration! And what better celebration than BOOKS? This week: a copy of Circe by Madeline Miller! 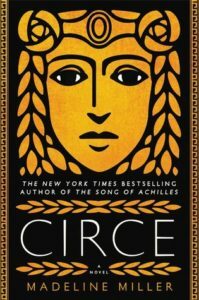 Giveaway is for one copy of Circe by Madeline Miller and is INTERNATIONAL. Winner will be notified by email and will have a week to respond. Please whitelist fangirlhappyhour@gmail.com so we can reach you!